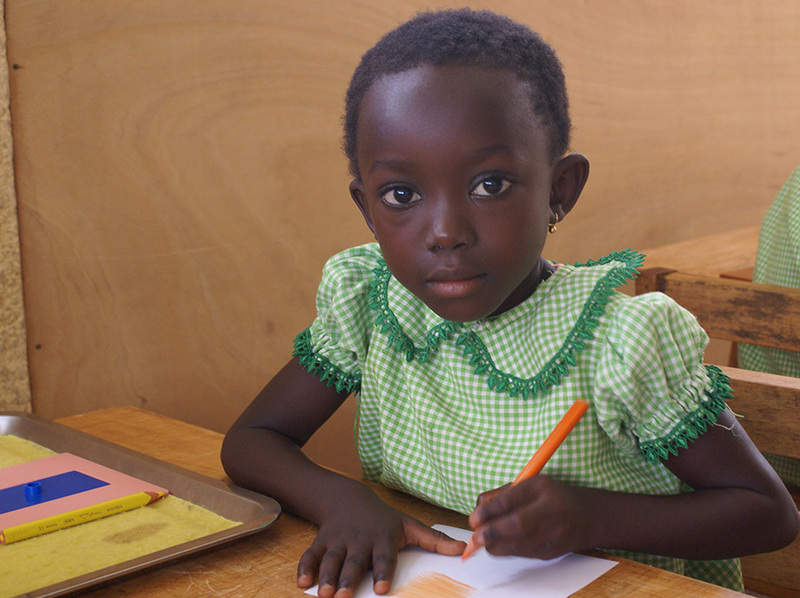 The Peter Hesse Foundation began in 1986 to improve early childhood education in Haiti, both by establishing Montessori preschools and training community members to staff them. This initiative has grown into a network of more than 50 schools serving over 3,800 children annually. In addition, more than 800 adults have been trained in Montessori practices and philosophy, providing both educational and economic support to Haitian communities. The Peter Hesse Foundation began its Montessori initiative with the objective of improving the quality of early childhood education in Haiti. To be able to do this effectively, the Foundation launched its efforts in two directions: training teachers and establishing preschools. A teaching training center, "Centre Montessori d'Haiti" was created in 1986 to train teachers to teach children between the ages of 2,5 to 6 years old. A Montessori demonstration preschool, where student teachers could experience the Montessori method in action, was attached to the center. Today, the Montessori initiative has evolved into a network of preschools and teacher training centers, directed and run by graduates of the "Centre Montessori d'Haiti". The Peter Hesse Foundation continues to support its Haitian Montessori initiative by granting scholarships to individuals who will work as teachers for at risk children. Currently, there are two courses available to teachers: Certificat d'Aptitude Professional and a Montessori preschool course. The Foundation assists qualifying graduates with furniture and didactical materials to open Montessori preschools and provides on-going technical support to these schools. So far, the Foundation has helped over 50 schools that benefit an average of 3845 children yearly. More than 55% of Haiti's children still do not attend school. The government lacks the economic capacity to provide free education to all children and less than 25% of existing schools are government funded. Private schools outnumber public schools by 65% at the elementary level and 85% at high school level. These private schools are run by religious organizations, non-governmental aid organizations and private individuals. The quality of instruction varies considerably and there is no quality assessment except at the end of the high school cycle. overcrowded classrooms. Classrooms are usually packed with 50 or more children to one teacher. a shortage of books and visual aids. poorly prepared teachers. More than half (57 %) of the teachers have less than high-school-level education and only 1% of the teachers have any kind of teaching diploma. learning in a foreign language without comprehension. Children speak Creole at home, but are expected to speak, read and write French at school. The public education system does not include preschool. All existing preschools are private. This means that most of the economically disadvantaged children are excluded from education at the most crucial stage of their development, when the wiring and sculpturing of the brain, that builds the capacity for learning, takes place. Traditional Haitian schools are in desperate need of modernization, children do not learn to solve problems or to think creatively. Rote learning is very much the norm and knowledge is measured by how well a given text can be repeated word by word. Individual thinking is discouraged, since educators still believe that "children should be seen and not heard". Curiosity and questioning are often viewed as confrontational or rebellious by teachers and, therefore, dealt with harshly. This kind of education stifles analytical thinking and limits the next generation from participation in policies that affect their lives. Given Haiti's background of violence, political turmoil and civil unrest, a different kind of education is necessary. In the spirit of help for self-help, the Peter Hesse Foundation assists Montessori graduates to open Montessori schools for at risk children, if the local community provides support to enable the school to become financially sustainable. The Foundation trains teachers, provide Montessori materials, furniture and, in some cases, renovate or construct a building for the functioning of a school. The Foundation also provides ongoing technical support, in-service training and site visits to the established schools. Visits are made to individual schools according to the amount of technical help that the school needs. Each year during the "Grandes Vacances" - the 5 week school vacation - the Foundation conducts workshops and seminars to allow teachers to create learning materials, revise teaching techniques and exchange teaching experiences. This period is also used for special interest seminars such as using the internet, teaching French as a foreign language, gardening, environmental friendly practices and techniques in art and other subjects that are pertinent to raising the competency of teachers. 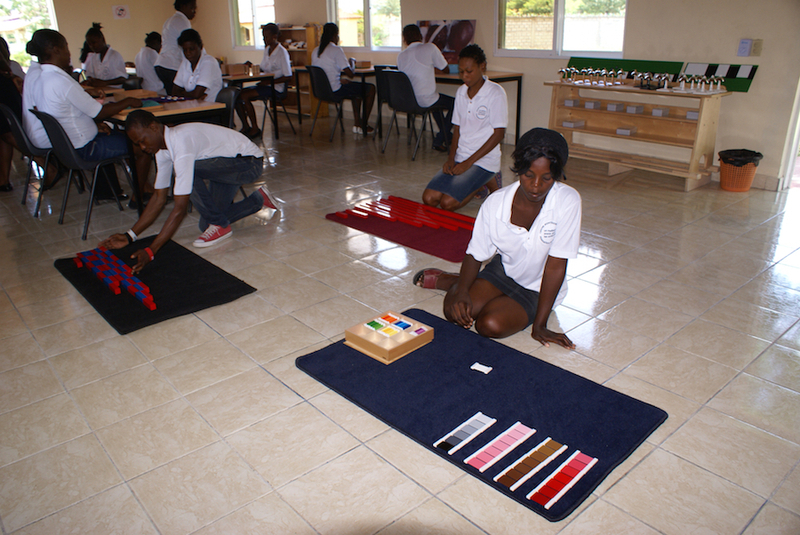 Why use the Montessori Method in Haiti? The Montessori Method proved to be a suitable solution to allow teachers with a low level of education to be functional in the classrooms, since the Montessori materials, when used correctly, are self explanatory and children can derive information from them without depending solely on the teacher. The materials also help to bridge the gap between language and the acquisition of skills, since using the materials does not require extensive explanation. Rote learning is unnecessary since the materials promote comprehension. The materials also compensate for the shortage of books that is the norm in most Haitian classrooms and is cost-effective, since they do not need to be replaced frequently. 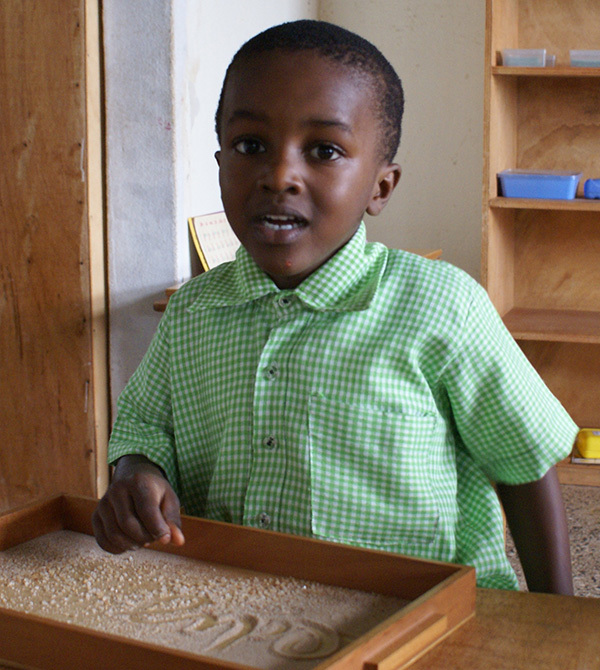 The Montessori environment is orderly in contrast to the makeshift environments that most Haitian children are used to. In depressed urban areas, a household may consist of extended family members and various relatives sharing a very small living space, and children are given the last consideration in the social pecking order. In the Montessori environment, children are respected and are free to pursue activities of their choice. This freedom allows children to feel good about themselves while promoting the development of powers of deliberation, initiative, independent choice and self-discipline with the emotional compliments. In the Montessori environment, each child is an active participant in a group and can contribute to the group in a positive way. The Montessori Method promotes peaceful behaviour. Haiti has a history of violence and Haiti's children desperately need an environment that is safe and secure. The Montessori environment provides a place absent of corporal punishment where children can feel safe. Mutual respect for each other and the environment promote fundamental qualities of social awareness and social behavior for the benefit of the group. Habits of social behavior learned at a time when the children are constructing their personality will last throughout their lives. The window to instill in its citizens the respect and thoughtful approach to problems is during those early years when the child's personality is still forming. These children will become the decision-makers and leaders to create a society of respect and cooperation essential to Haiti's future.